Personally, I’m not cover-type person. I prefer my electronics bare. 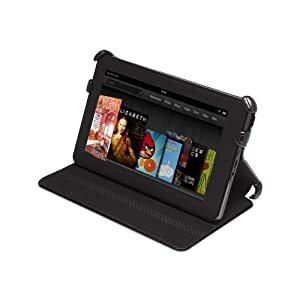 Kindle Fire is no exception. 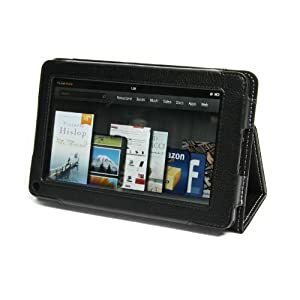 I did order Amazon recommended Marware Kindle Fire Cover for review purposes only. If you look at my Kindle Fire Scratch test you should get the idea that it is a strudy device and it fend for itself quite well. Screen protector is a definite waste of money and will only diminish screen quality. However I’m well aware that there we people unlike me who love to pamper their devices and just must use some cover, skin or a sleeve. It is for such people I write this review. Since I have both accessories here in front of me, lets compare them. Both covers are made of leather. Marware is smoother, while Snugg is more coarse. Both feel pleasant to the touch. It is a matter of taste and therefore a tie. Snugg uses leather envelope and hidden velcro to hold the device, Marware uses metal braces covered by leather. Although both covers hold Kindle Fire securely, Snugg is much nicer looking. One point to Snugg. Marware uses rubber band to hold the cover closed, while Snugg uses magnets. Both ways seem to have cons and pros. With band you can also hold the cover in the open position and overall more secure. While magnets make the cover easiers to open and involve less parts that can get tangled. I call it a tie. Snugg build quality is flawless (white stitches are clearly visible and perfect), Marware is also quite nice except for the aforementioned metal braces. Therefore one point to Snugg. Both covers sport a rubber band for holding the device more securely. Both allow landscape reading position. However Marware cover requires you to unbuckle the device from two of the hinges to use this position. A minor inconvenience but inconvenience nonetheless. Snugg also advertises comfortable typing position. Although you can put Marware cover into a similar position, it doesn’t hold itself securely in it due to lack of locks. One point to Snugg. Both covers make power button and connectors easily accessible. One of the nefarious hinges on Marware cover obstructs part of the right speaker. While I don’t think it will affect listenting experience (remember we are talking about tiny cheap portable device speakers here that are so close to each other there will be no noticeable stereo effect) it is a design flaw nonetheless. Half point to Snugg. Snugg is available only in Black, while Marware if available in Black, Brown, Charcoal, Green and Pink. Finally a point for Marware. Although Snugg cover covers the top of Kindle Fire and gets really close to screen edges it doesn’t obstruct them. You can still slide out notification and settings bar from the top and button bar from the botton. I played a few rounds of Fruit Ninja and the cover didn’t interfere with the game. I guess that by now it would be clear that I’m definitely leaning in favour of Snugg. Don’t trust me? Take a look at reviews on Amazon: although Marware sold much more covers due to being featured on Kindle Fire page, only 35% of their reviews are 5-star. Snugg on the other hand sports 83% 5-star reviews. Conclusion: if you are unlike me and into covers – try Snugg. To me it definitely seems like a better deal.